Drones equipped with remote sensing systems are rapidly becoming a valuable tool for emergency response units as they can quickly provide reliable information after an incident. However, controlling these vehicles and interpreting the obtained measurements also imposes further demands on the response squad in an already stressful situation. 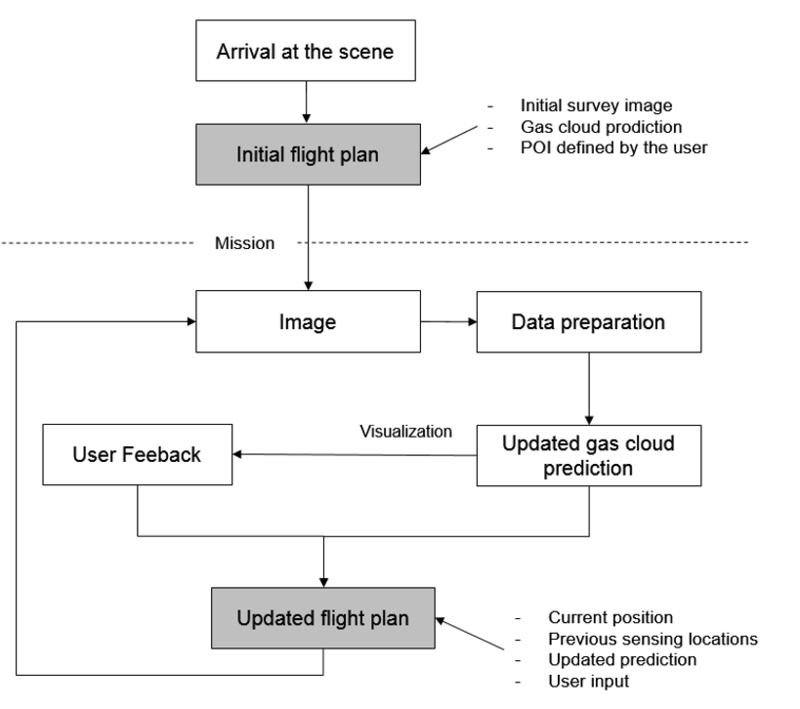 Therefore, integrated and automatic mission planning tools are needed that plan drone routes such that the maximum amount of information is provided within as short a delay as possible. Several objective functions I(P) exist to describe this informativeness. Two of the most frequently used ones in literature are - Maximising the achieved reduction of the prediction error variance, - Maximising the mutual information between observed and unobserved locations. The prediction error variance increases the further away an unobserved location is from a selected sensing location. Similarly, the mutual information typically decreases the farther locations are from one another. Hence, both measures favour sensing locations that are well distributed across the region of interest. However, both of these approaches require a reliable model of the observed phenomenon in form of a Gaussian Process in order to determine error variances and mutual information. In practice, it is unlikely that an accurate process model is available before the start of the drone flight. We therefore use an approximate model of spatial correlations. While this approximation is not an accurate description of the observed phenomenon, it can be computed more efficiently, which is highly relevant for a time-constraint application such as the use case considered here. Similar to the two measures discussed above, it considers paths as “informative” that consist of sensing locations distributed as evenly as possible within the target region. Rather than solving an exact model, we use a heuristic solution approach for determining drone routes. An initial path is determined using a simple construction strategy. Then, this path is iteratively improved by destroying and rebuilding parts of a solution using an Adaptive Large Neighbourhood Search approach. These approaches have been shown to quickly determine high-quality solutions even for large vehicle routing problems with several hundred candidate sensing locations. We evaluate the proposed model and solution approach in an extensive simulative study on artificial spatially correlated random fields. This way, we can consider scenarios larger than any that would be possible in preliminary test flights, and validate the robustness and effectiveness of our approach on a wide range of possible situations. Figure 2 gives one example of such a scenario: We consider a target region of 1200 x 1200 m, and a drone with a maximum flight time of 900 seconds at a maximum speed of 10 m/s. The left image represents the actual distribution of values within the target region, i.e. the simulated smoke cloud. Below, we present the results of the solution approach. The middle image indicates the remaining prediction error variance. Here we can recognize selected sensing locations for the drone flight dark red. At these locations, the drone obtains accurate information about the random field, which means that error variance is minimal. For the remainder of the target region, error variance increases with increasing distance to the next sensing locations, since there is less information is available about these locations. The resulting prediction is indicated on the right hand side. Obviously, the information gained about the underlying process is rather accurate, as the prediction closely follows the actual distribution. Hence, even though the maximum flight time would be insufficient to survey each location within the target area, it still allows to accurately detect the smoke cloud and to provide detailed information about the spatial distribution of hazardous gases. Figure 2: Autocorrelated field, predicted values and prediction quality.